COD Digester India, COD Digester Manufacturer, COD Digester Suppliers & COD Digester Exporters in India. 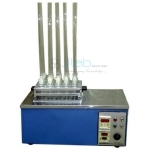 JLab is renowned Exporters & Manufacturer of COD Digester & Scientific Lab Instruments India, COD Digester Exporters, COD Digester Suppliers India. COD Digester is the most accepted Thermoreactor for Determination of Chemical Oxygen Demand in Various Substances.